Why treat just one room when you could improve the air in your entire home?You’ve probably seen the TV commercials and heard the claims – you may have one, two, three or more in your home right now – in your basement, family room or bedrooms. But whether it’s a portable air purifier, humidifier or dehumidifier, the truth is these units just don’t work for anything other than temporary one-room relief.To treat the problem in multiple areas or throughout your entire home, you need to purchase a number of expensive, energy-wasting portable or room units. A better solution to multiple units – an Aprilaire whole-home indoor air quality product. Attached to your central heating and cooling system, they provide superior relief in every room of your home. Portables, otherwise known as tabletop or room units, only treat the air in the immediate vicinity of the unit. You need a separate unit for every room, area or level of your home. Portable units often require frequent cleaning and maintenance. Some units, if not properly maintained, may pose a hazard to you and your family’s health. This is often the case with portable humidifiers and dehumidifiers where standing water can pose a health hazard due to biological contaminant growth. Portable units are oftentimes noisy and can be unattractive and obtrusive to your living space. Multiple portable units consume more energy than a single, whole-house solution. Aprilaire whole-home products can treat every room of your home. Aprilaire whole-home solutions require infrequent cleaning and maintenance. Air cleaner filters require changing every 6 months to 2 years depending on the model and how often the unit is run. Humidifiers and dehumidifiers have no standing water and no buckets to clean or empty. Installed directly to your heating and cooling system, whole-home products are installed out-of-sight and away from living spaces working silently and automatically. 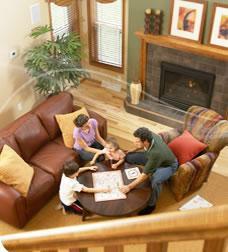 Every Aprilaire central indoor air quality solution is designed with maximum energy efficiency in mind.